The cover art brings to mind what could be a ECM release and the music has a heavenly almost spiritual atmosphere. Knowing that the theme of the recording was built around the sadness that Jon felt having to be away (or say goodbye each time) from his family while working on this music really penetrates the listener. When I spoke with Jon he described this as a “sweet sadness” though. The kind only a loving father and husband understands. 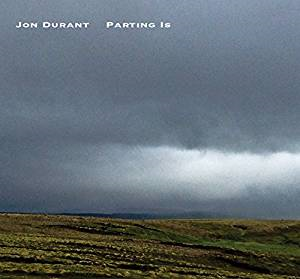 Without a doubt ‘Parting Is’ brings forth a meditative state of mind, but never dull or depressing. Nine tracks present a mindful and broad textured canvas. Jon has many years of experience with greats like Tony Levin, David Torn, Michael Bearpark, and Colin Edwin (who Jon made three fabulous albums with under the name Burnt Belief, which I highly recommend). This 2018 solo has Jon doing a grand job with the kind of perfection that only a disciplined and well-seasoned artist can achieve in their lifetime. The select pieces with fretless bass may remind some of Tony Levin (tracks 3,8) and fretless guitar used much like bass (tracks 2,4,6,7) but a higher register, are fluently placed. The sweet sadness of each note brings beauty. This is not a cookie cutter guitar solo, nor should it be classified as ambient. As a collective, the compositions beg to be referenced, however anyone in love with the more mellow atmospheric works of David Torn or Erik Wollo, would be smart to purchase this. Jon has honed his craft and delivered pristine music year after year. Thus as to why his performance sounds so effortless and sure. Beautiful transcendence indeed. VERY RECOMMENDED.